Thursday, February 7, 2019 ~ 1:00 p.m.
Thursday, February 7, 2019 ~ 12:00 – 1:00 p.m.
August “Gus” J. Prochaska, 88 of Fremont, NE passed away Monday, February 4, 2019 at his home under hospice care in Fremont. He was born November 5, 1930 in Bison, OK to John and Lillian (Voboril) Prochaska. Gus attended schools in Missouri, Prague, and Wahoo. 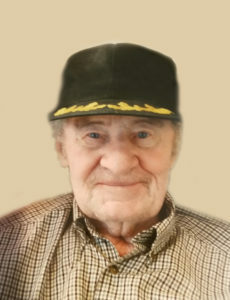 He served in the Navy from 1948 to 1951 during the Korean War. After being discharged, he worked for the railroad, the ordinance plant in Mead, and Continental Can from which he retired. After retirement, they moved to Fremont. He was united in marriage to Donnetta Rohwer in 1954, and they made their home in Yutan. Together they raised four children: Randal, Sharon, Steve and Paul. Gus is survived by his wife, Donnetta; children, Sharon (Jack) Styles of Mitchell, SD, Steve (Linda) Prochaska of Fremont and Paul Prochaska of Fremont; daughter-in-law, Donna Prochaska of Milton, PA; eight grandchildren, Zach Prochaska, Shawn Styles, Carrie Maus, Theresa Senst, Cody Styles, Tom Prochaska, Melissa Halladay, and Jeremiah Prochaska, and 13 great-grandchildren. He was preceded in death by his parents, John and Lillian Prochaska; son Randal Prochaska; grandson, Jackie Styles, Jr.; brothers, John and Paul and an infant sister. Prayers to the family. Sorry we will not make it to the funeral, as we are in AZ for the winter. Gus was a really good man, always willing to help anyone.